This Cream Cheese Fruit Dip is our very favorite dip to eat with fruit! I’ve probably already written this sentence a time or three, but here it is again: Cream cheese makes everything better! Whip the cream until it forms stiff peaks. In a separate bowl, cream together the cream cheese, maple syrup, vanilla, and lemon or lime juice. Fold cream cheese mixture into the whipped cream. Chill until ready to serve, or serve right away. Tastes great with strawberries, grapes, and apples. Makes about two cups of dip. I’d love to hear your opinion on this one! I was wondering… can you make homemade vanilla extract without vodka? We have spiritual convictions to not purchase alcohol- even for cooking. I looked into it a while ago because so many alcohols include gluten. The answer I got was…NO. Vanilla powder? I think that some vanilla is made with glycerin??? Might be an option, but I’m not sure how to do it! What about making vanilla sugar/maple syrup/honey and just adding that to your baking? You could make a simple syrup infused with vanilla bean. You’d have to keep it refrigerated though. Definitely D. By the way I got the E book bundle. I am waiting for product and using some of the programs that expire shortly. Many books to not apply to someone 73 years old, a widow, and whose grandkids had better not be producing greats until they are married. I already have your stuff. Definitely worth it though. Yum!! Pinned and shared on FB…such goodness!! All of the above, of course. That’s a silly question. D is the answer. Whew. Glad I passed the test. D!!!!!!! Got to love them all! The answer is definately “D” — ALL of the above. Yumm!!! All of the above plus peanut butter. I love to add peanut butter to my fruit dip! d) All of the above, if it also includes chocolate! All of the above sounds good, but my ultimate choice would be BUTTER. 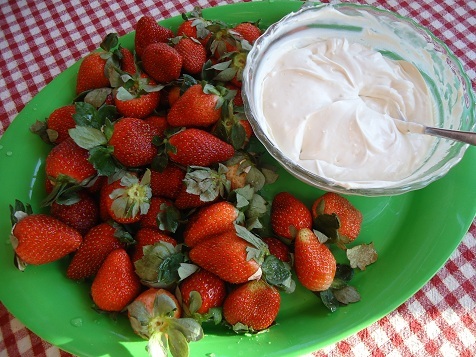 :) I just made your strawberry fruit dip, but will have to try this one later since I have some cream cheese in the fridge awaiting a yummy recipe. All of the above for me! Of course, chocolate is a good addition, too! I love fruit dip – pinning! You can always make dairy free dip with canned coconut milk. Leave it in the fridge over night and the thick goodness separates. Delish! I’d say A or D or berries lol I love them! Dairy is my favorite food group! Dress fresh garden lettuce with a mixture of cream, apple cider vinegar, and a bit of sweetener (vinegar will slightly thicken the cream). My husband grew up with this, and it’s pretty yummy! See, you CAN put cream on lettuce, too! My philosophy is that every good dish begins with butter and ends with cream. We love all of the above, but I have a question. I have recently been reading about all of this acid reflux my children seem to be having, and came across the GAPS diet, where they mention that fruit should not be eaten with any other food because it causes acid in the stomach. I was wondering, with all of your health experience, have you guys noticed any acid stomach with mixing fruit with your meals and such? Definitely D! Thanks for the recipe. Pinning it. Just made this to feed the grandkids for snacks next week. MMMMMmmmm! It’s so good, I just want to eat it with a spoon! As usual, I didn’t read the instructions first and I didn’t have whipping cream and thought I could sub half&half. I mixed up all the ingredients except the cream first then added some half&half while mixing it with the hand mixer. Turned out great even though I botched the directions! I made this last night, to eat with strawberries. It was a hit! I tried it tonight on my never-ending quest to copycat a maple-cream dip I had with sweet potato fries once. While this wasn’t it, it’s going in the office potluck rotation!